Tiny video cameras on tail feathers of crows helped researchers discover that the birds use a variety of tools to seek food, and even make their own tools, plucking, smoothing and bending twigs and grass stems. "We observed a new mode of tool use that was not known before. We saw them use tools on the ground, using a little grass stem to poke and fish into nests," researcher Christian Rutz of England's University of Oxford said in a telephone interview. New Caledonian crows had been known to use sticks to probe rotting trees for grubs, but they were never seen to use tools on the ground before. "The ecological niche they exploit with tools is larger than had been thought," Rutz said of the findings published in Thursday's online edition of the journal Science. Rutz's research team studies New Caledonian crows in the lab where they have been known to bend wires into tools to retrieve food. They wanted to see whether the crows have similar behavior in the wild. But it is hard to observe the birds on the Pacific island of New Caledonia both because of the heavy forests and the birds' sensitivity to the presence of people. So they came up with the idea of feather-cam, a 13-gram video camera they tested on lab crows and then took to the forest. A gram is about the weight of a paper clip. The camera is attached to the tail feathers of the crow and bends forward to record the belly, feet and sometimes the head of the bird. "They do make tools, which is quite unusual. They do not just pick up any random twig," Rutz explained. He said the birds select the twig they want, break it off and sometimes smooth it or bend it into a hook. They also like to use dry grass stems, which are more flexible, he explained. Especially good tools were kept for future use. The crows were observed to eat an average of eight small items per hour, such as beetle larvae, small lizards and small fruits. "When you observe them, it's astonishing," he said. "It's so unusual." "One has to be careful," Rutz added, "but just because something looks smart to the human observer doesn't mean it is smart." For example, he said, "We wouldn't call a spider clever because it builds a web as a tool. ... 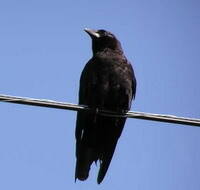 It could be that these crows are very good at what they are doing, which is using tools." He said the scientists are looking for environmental factors that might have selected for this behavior in the evolutionary past.